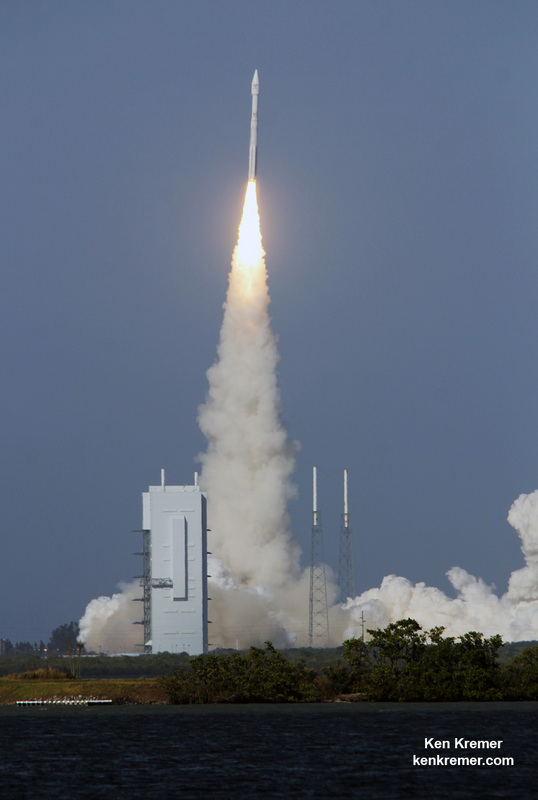 CAPE CANAVERAL AIR FORCE STATION, FL – Sunday afternoons blastoff of the powerful Atlas V rocket from a seaside Florida launchpad has produced a plethora of amazing imagery as the 20 story tall rocket zoomed to orbit with the 7.5 ton EchoStar 19 high speed internet satellite. EchoStar 19 or XIX, is the highest capacity broadband satellite ever built and launched and promises a vast increase in capacity for homes and businesses subscribing to HughesNet® across North America. Check out this expanding and explicit gallery of eyepopping photos and videos from several space journalist colleagues and friends and myself – and revealing how EchoStar earned its way to geosynchronous orbit from prelaunch to launch atop a United Launch Alliance Atlas V rocket. The ULA Atlas V blasted off from Space Launch Complex 41 (SLC-41) Cape Canaveral Air Force Station at 2:13 p.m. EST at lunchtime on Sunday, Dec. 18, 2016. EchoStar 19, also known as Jupiter 2, marked ULA’s final mission of 2016 – completing a dozen liftoffs and a dozen sterling successes. ULA has enjoyed a 100% success rate for this 68th Atlas V launch stretching back to the company’s founding back in 2006. 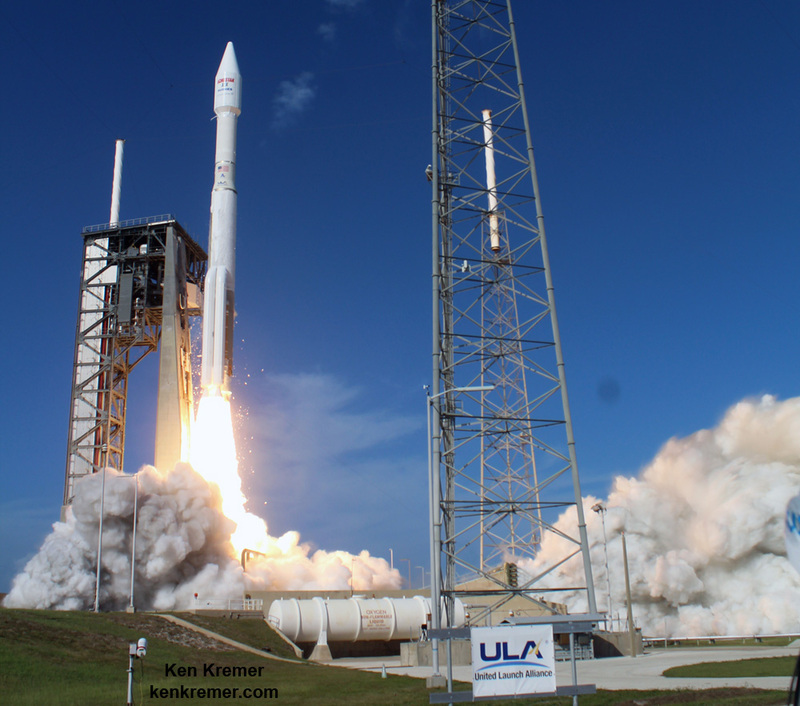 ULA is a joint venture of Boeing and Lockheed Martin with 115 successful launches under its belt. The 194-foot-tall commercial Atlas V booster launched in the 431 rocket configuration with approximately 2 million pounds of first stage thrust. This is the 3rd launch of the 431 configuration. All 3 delivered commercial communications satellites to orbit. Here’s a trio of launch videos revealing different perspectives of the launch, including views from a remote video at the pad, a remote time-lapse camera at the pad, and from the Kennedy Space Center Visitor Complex at the Apollo-Saturn center. December has been an extremely busy time for launches at the Cape, with three in the past week and a half supported by U.S. Air Force’s 45th Space Wing. These include NASA’s CYGNSS hurricane mission launch by an Orbital ATK Pegasus rocket on Dec. 15; and the WGS-8 military communications satellite launch for the US Air Force by a ULA Delta 4 rocket on Dec. 7.